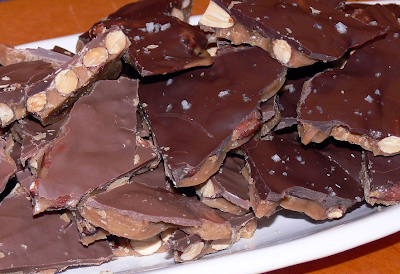 This would be a great gift idea for the holiday season...make a batch of this brittle, and wrap it up with a festive bag and ribbon! I might have to put some in my mom's stocking this year, she loves peanut brittle. Remove from heat; immediately stir in butter and baking soda; pour at once onto cookie sheet. With 2 forks, lift and pull peanut mixture into rectangle about 14x12 inches; cool. Meanwhile, heat dark chocolate bar chunks in intervals via Microwave (or use double-boiler). Spread melted dark chocolate over top of brittle. Cool completely, refrigerating to speed up if you'd like. Snap candy into pieces.